Dates and times of events are local time, Hawaiian time. USS Ward sinks a Japanese midget submarine outside the entrance of Pearl Harbor. This is the first shot fired by the United States in the Pacific phase of World War II. Japanese submarine sinks US merchant ship Cynthia Olsen 1000 miles northeast of Hawaii. All 31 crew members take to their lifeboats and eventually all die at sea. Japanese attack on Oahu begins with an attack on Wheeler Airfield, soon to be followed with attacks on military installations at Kaneohe, Hickam, Pearl Harbor, Ewa, and Bellows. First attack wave on Oahu ends. Japanese ambassadors present the US with a message breaking off negotiations - one hour after the attack on Oahu began. It was supposed to be delivered at 1300 hours - twenty minutes before the attack began. Second attack wave on Oahu begins. Japan attacks the International Settlement in Shanghai, captures American and British servicemen and the USS Wake - the only US Navy ship to be captured during the war. 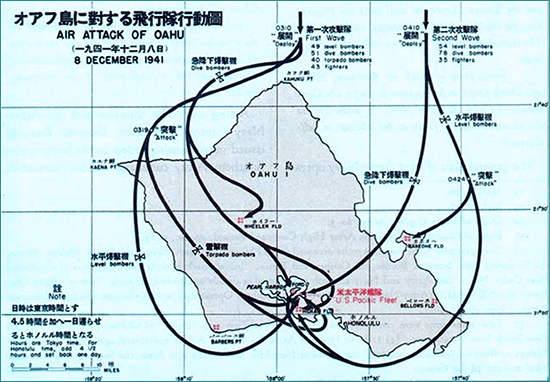 Japanese attack on Oahu ends. Japan raids Singapore with planes. It will later invades Singapore on February 8, 1942. The forces of the United Kingdom will surrender on February 15, 1942. Japan attacks Guam. The forces of the United States will surrender on December 10, 1941. Japan attacks the Philippines at Batan Island. The forces of the United States will surrender there on April 9, 1942, and at Corregidor on May 6, 1942. Japan attacks Hong Kong. The forces of the United Kingdom will surrender on December 25, 1941. Japan attacks Wake Island, southwest of Hawaii. The forces of the United States will surrender on December 23, 1941. A telegram which arrived on Oahu at 07:33 a.m. finally reaches General Walter Short, stating that Japan is planning to present an ultimatum at 07:30 a.m. Hawaii time, and advising General Short to be on alert accordingly. US planes are caught on the ground at Clark Field and destroyed by a Japanese air attack - ten hours after Hawaii was attacked. Six fighter planes from the USS Enterprise trying to land on Ford Island in Pearl Harbor are shot down by friendly fire. Three of the six airmen are killed. Japanese destroyers Ushio and Sazanami shell Midway Island, northwest of Hawaii.